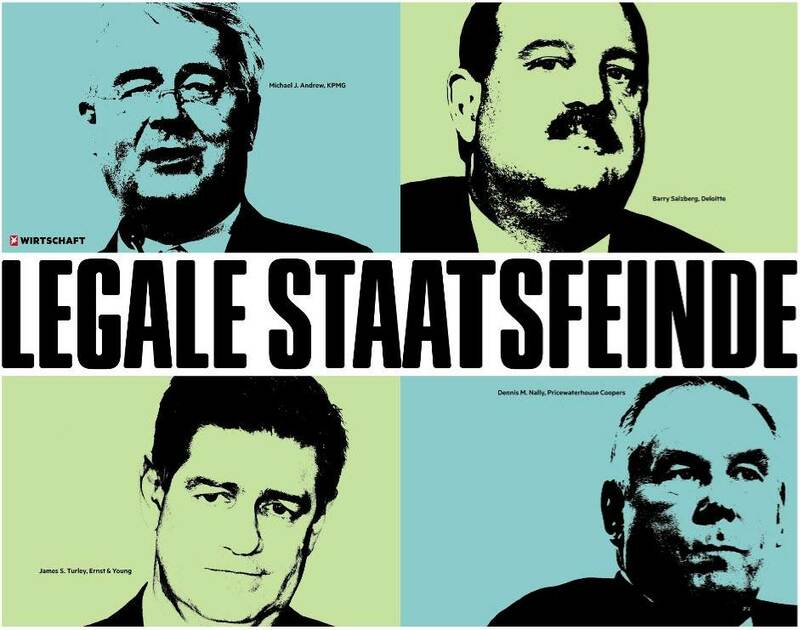 Tax Justice Network: Stern magazine calls Big Four bosses "Legal Enemies of the State"
Stern magazine calls Big Four bosses "Legal Enemies of the State"
Germany's Stern magazine has an article, not currently online, whose thrust is summarised in this remarkable picture. The article names the global heads of the Big Four accountancy firms, and the big headline translates as "Legal Enemies of the State." "Because of these men, corporations like Amazon, Google etc. pay almost no tax. With their 700 000 staff they skilfully create tax tricks. It is high time to drag them out of their loopholes." How apt. Absolutely right. The Big Four accountancy firms help multinational corporations (and other wealthy players) escape huge tax bills, shifting the burden of tax onto the shoulders of others: smaller more local businesses, individuals, the victims of public sector cutbacks, and so on. The ability of multinationals to harvest these tax subsidies helps them out-compete their smaller, more locally-based rivals, killing them in markets and driving them out of business. The result is greater market concentration, greater oligopolistic pricing power for the multinationals, greater influence for the tax havens that facilitate all this (thus providing cover for all manner of nefarious activity,) greater economic inequality around the world, and more. All this goes by the name (in the Anglo-Saxon world) of 'tax efficiency' - when these outcomes are all profoundly inefficient. "A lack of transparency and strict secrecy are part of the business model of the Big 4. As with the banks, nobody dares to break the wall of silence." It is fantastic to see Stern taking this approach. Spot on. Among other things, the authors read and understood our research about the propensity of big 4 firms to locate in jurisdictions which provide a more secretive legal environment. In tiny Cyprus, for instance, PWC alone employs over 1000 staff. "Michael Sell profoundly knows the big tax firms. He can assess the danger arising from the Big Four like few others. "With 32 I was employee of a big-four firm. There, I asked myself: do I want to help foreign firms save taxes in Germany all my life? I then changed to the federal tax administration." He begun to model and expand the central tax office on the example of the federal criminal investigations office - though he does not accept this comparison." A US senate report reveals what happens in sales pitches for new tax avoidance schemes: the clients do not receive computer files. Nothing is noted on paper. The sellers write everything on boards, which they wipe off afterwards." Stern investigates classic tax structures such as the "Double Irish", and lesser-known ones such as Cobra, Soap Picante, and Pita.